Former Manchester United player Clayton Blackmore says Ryan Giggs will have the respect of the players after taking temporary charge of the club. United have sacked manager David Moyes just 10 months after he succeeded Sir Alex Ferguson. Giggs, 40, will assume responsibility for first-team affairs until a permanent manager is appointed. "He's going to get the respect because he's done more than any other player in the Premier League," Blackmore said. Netherlands coach Louis Van Gaal, Borussia Dortmund boss Jurgen Klopp, Atletico Madrid's manager Diego Simeone and Paris St-Germain's former United defender Laurent Blanc have already been tipped as possible successors to Moyes. But Blackmore, a former United and Wales team-mate of Giggs, believes the veteran midfielder is the right man take charge for the short term at least. "For me he could be the man to look after the club in the foreseeable future," Blackmore told BBC Radio Wales. "Everybody starts somewhere and the experience he's got . . . 22 years' experience with Alex Ferguson so he knows everything Alex Ferguson's done. "You're being taught by him. The manager was brilliant at controlling players. 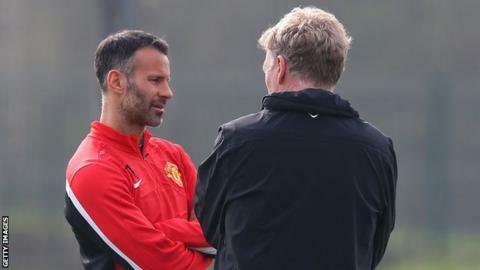 "He [Giggs] knows if he's going to be a manager first of all he's got to be in control of the players." Former Wales captain Giggs, who has won 13 Premier League titles with United, was appointed to the club's coaching staff in July 2013 following Moyes' arrival. Ex-Everton manager Moyes, 50, was chosen by Ferguson as the man to succeed him when he retired after 26 years in charge. Under Moyes, United have lost six league games at home and are guaranteed to record their lowest ever points tally in the Premier League. They were beaten in the FA Cup by Swansea at Old Trafford in January and knocked out of the Capital One Cup by struggling Sunderland in the semi-finals. His final match in charge saw United lose 2-0 at former club Everton on Easter Sunday. Moyes was dismissed at a meeting with executive vice-chairman Ed Woodward at the club's Carrington training ground. In a statement on Tuesday the club said it "would like to place on record its thanks for the hard work, honesty and integrity he brought to the role".